Having had these brushes in my arsenal for around 6 months now, I thought now was the perfect time to review them. I don't normally do brush reviews immediately ( or any reviews quickly ) because there items I like to see how well they last after numerous washes and uses. I'd rather put out a review where something has really been for a test drive. 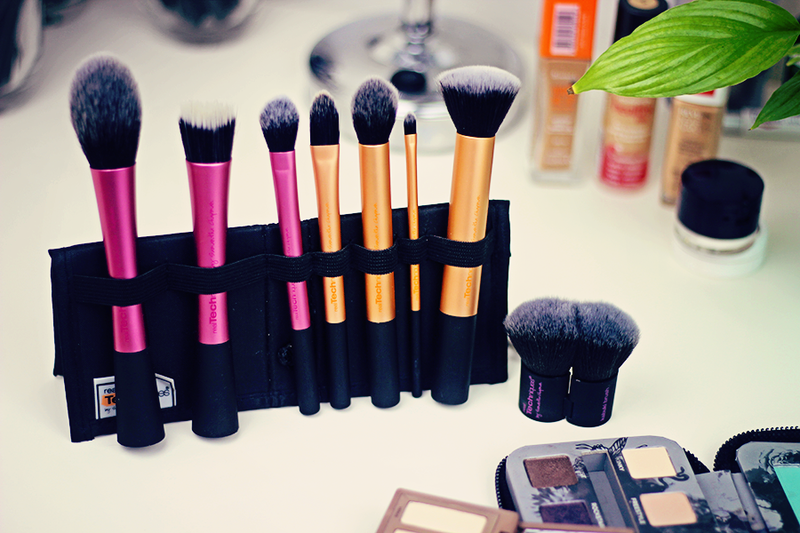 Here I have the Core Collection, Kabuki brush, Blush Brush and Setting brush. You will notice the stippling brush in the holder, read that review here. I have had brush sets that have ranged from £15 - £180 and they've all been used and cleaned the same way and it's funny that some haven't even lasted a year before they glue becomes loose inside and the hairs start to shed dramatically and completely fall out. I get so shocked & misled by reviews because people pay money for brushes that are sold at such a high standard and yet you get such a bum deal in the long run. So before I go reviewing and recommending sets for people I wanted to see how these lasted. Being that these are permanent brushes I did take a slight advantage. Sorry! 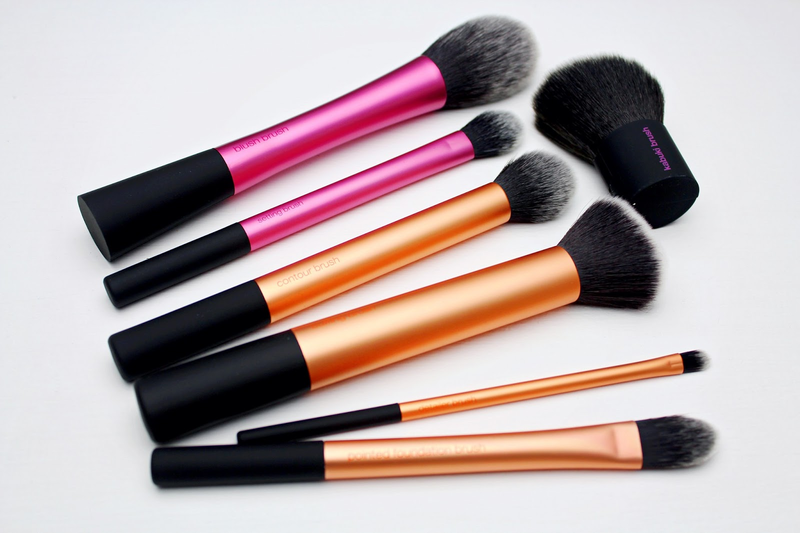 Products : Within the Core Collection (orange) includes four brushes, Detailer, Pointed Foundation, Buffing and Contour plus a dual carrier and stand. The other three singular brushes are the Setting, Blush and Kabuki. The designs of the brushes add flavour to the other brushes in my collection which range from baby pink, grey and black. Detailer: This I find is o.k. if you have little troubled areas you want to pin point to conceal or for the lips too, I already use a few lip brushes I like but to clean up any edges I will pick this up. Pointed Foundation : The reason I like this brush is because it's smaller than other foundation brushes I own, it allows for more accurate applications. I use this for my under eye concealer as it always me more & quicker coverage than my other concealer brushes before blending it out. 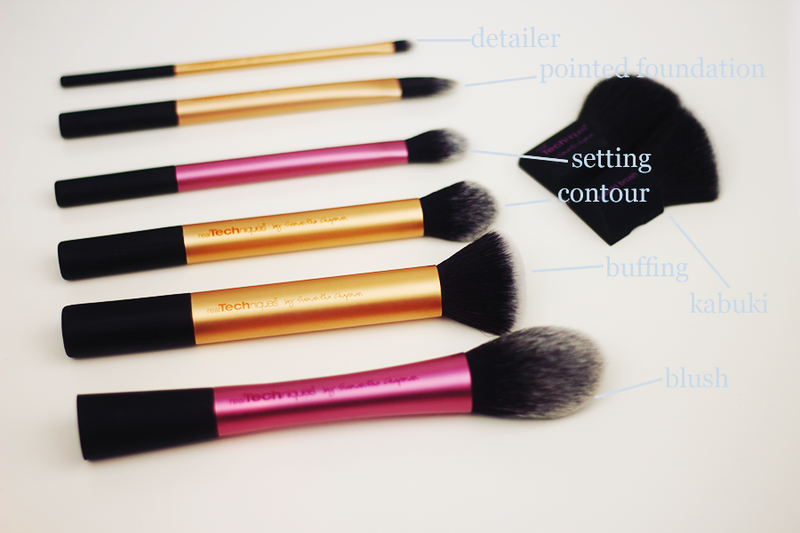 Setting : Ah my setting brush, love this to set my under eyes, my nose, chin and above the lip. It's also another good one to highlight with also in those areas as it's smaller than the contour brush that I use on my cheeks to highlight sometimes. Contour : I use my fan brush to contour, I always have, never given me any problems and it's one I will likely stay with that being said I have used this to contour. I like that it's tapered and smaller than the Kabuki to contour so you can be more precise within the hallows of your cheeks but what I have also use it for is highlighting. Kabuki : Your 2-in-1 brush, the novelty part of this brush is that it opens up, you can use it closed to define your cheekbones and closed to apply blush to the apples of your cheeks. I think it's a handy brush to have on a night out perhaps but I'm not sure if it's 100% necessary like me if you have the contour & blush brush already, the kabuki isn't needed. It's a rainbow shaped brush once fanned out with it being quite thick in the middle, it's to heavy in the centre. I love to define cheekbones I don't have and I feel using this doesn't give me personally the control I like. I do prefer brushes that aren't as dense for contouring. Buffing : This brush was recommended to me, unfortunately it cannot be purchased singly and is only available within the Core Collection kit. It's easier to applying foundation than the stippling brush by far (keep that for cream blushers), gives me a nice smooth coverage. I don't pack the foundation on, once I've mixed my shade in a palette I dip and build up to the desired coverage. I would recommend this if you like a more finished look to your foundation. Blush: I don't use this for my blush a lot, it's a large tapered brush I use for my bronzer mostly. Depending how I'm applying my blush, if it's just on the apples, this isn't a brush I use, if I'm sweeping it upwards and I want to cover more area then yes. How it's tapered I feel once the bronzer is on the top of the brush I can guide it precisely for my bronzer. Shedding : The only brush that has started to lose a few hairs is my first brush from the real Techniques collection, the stippling brush, I've lost a few out of them during a wash. Nothing to signal the brush will be bald next week but the others I've yet to experience shedding in 6 months but I'm still keeping an eye out. Cleaning : The hand-cut synthetic taklon bristles I continue to clean all my brushes with the Dr. Bronners soap, gets them clean quickly enough, don't have to keep going over a brush, the feeling of the brush hairs haven't changed, the stippling brush feels a little clumpy & greased sometimes after a wash & yes all the soap is washed out, maybe I should try something else to wash the stippling brush. Honestly these are affordable brushes for anyone, being that for me, I've found these one of the softest I've used. Great grips, easy to clean. After 6 months they've really held there own and kept up the quality. 100% cruelty free. I keep them in the stand / travel case as it keeps them free from excess dust and once I've washed them I let them stand upside down to dry in the stand. When I tell people to start with these brushes if they want to have a start up kit without splashing the money they think I'm insane when I say the price for the brushes until I explain, break down the maths on some others. Really I should just go work in Boots! Real Techniques fans, what are your favourite(s) from the range? *ThESE ProductS was sent to me for consideration for a review. This does not sway my opinion. This is 100% my view and research is that of my own! AFTER A LONG 6 MONTHS! That's a great review! I've ordered mine and can't wait to get them in my hands! I have the stippling and blush brush, I'm so desperate to try the others now! These are lovely!!! I can't wait to get my hands on them !!!! Fab review! I've seen loads of reviews on RT brushes. I have the buffing brush but I got it about a year ago, I think? And it came as a single? It looks like the buffing brush anyway, ha! I do like the brush, wish it was a little denser though. But it still does the trick. I have soooo many brushes but your review is telling me otherwise, you enabler!